An invaluable addition to any Tudor history bookshelf. We learn something of Chapuys the man as well as the ambassador. It is impossible to have read so much as a Ladybird book on Henry VIII, his multifarious wives, ministers, victims and hangers-on, without having come across the name of Eustace Chapuys. Chapuys’ detailed letters and reports from his ambassadorial mission in England to his master, Emperor Charles V, give much of the detail for the period 1529-1545. But, so far as I am aware, there has never before been a biography of him in English. Ms Mackay sets out to remedy that lack in handsome style. She meticulously covers the early education and career that fitted him for the post of Imperial ambassador during one of the most turbulent periods in European history, the early Reformation. We tend to think of Chapuys purely in terms of Henry and Katharine’s matrimonial troubles, but his brief was much wider than that. Whilst Charles relied on him to counsel Katharine and exert pressure on Henry to drop the annulment, he also had to manage other aspects of relationships, such as trade and the protection of shipping. Ms Mackay shows Chapuys arbitrating in disputes between merchants and establishing complex networks of informants and friends in the city of London as well as the court, to encourage trade between the Low Countries, and England which had been a staple of the economies of both for hundreds of years. Supporters of Anne Boleyn tend to regard Chapuys as a hostile witness, using the information from his letters to understand what was occurring, but caveating the bits they don’t like with reflections on his allegiances, and blaming him for some of the nastier propaganda against Anne. Ms Mckay points out that, certainly during the first years of his embassy, he was more guarded in tone and language than his detractors say. In fact, Mackay draws some interesting conclusions from the material about his relationships with both Thomas and George Boleyn to show that he didn't just dismiss them out of hand as promoted by Henry to please Anne. Instead he appreciated the diplomatic skills of both father and son. Chapuys’ relationships with other members of the court are also fleshed out – the mixture of provocation and flattery with which he handled Henry; the respectful and formal ties with Norfolk and the almost-friendship he had with Cromwell. At the heart of Chapuys’ first years in England, though, was his relationship with Katharine. Mackay shows how he supported, comforted and counselled her. While of course there could never have been a romantic relationship between Katharine, a married woman and a Queen, and a humbly born cleric, her nephew’s ambassador, yet there is a hint that Chapuys, only a few years younger than her, saw Katharine as a damsel in distress whom he could rescue. We also see Jane Seymour through Chapuys’ rather cynical view – although he welcomes her arrival to supplant Anne, he seems to have rather less respect for her than for the woman who was a worthy foe and whom he clearly believed to be innocent of the charges against her. He sniggers at Henry’s infatuation, suggesting that it was highly unlikely that Jane was the naive virgin she presented herself as. We tend to think of Chapuys’ time in England as the most important aspect of his life, but of course, it was a period of only 16 years in a life of over sixty. On his departure from England in 1545 his only slight regret seems to have been leaving the Princess Mary, whose interests he had closely guarded for the whole period of his embassy, and for whom he clearly felt genuine affection. His new interests, however, soon occupied his mind. In his retirement in Louvain he set himself to educational projects. On the downside of the book, there are some grating slips in precision on some of the surrounding facts. Cromwell is referred to several times as Chancellor, a post he never held, and James IV of Scotland, Henry’s brother-in-law, in some counter factual world, did not perish at Flodden in 1513 but was still alive and well in the 1530s, annoying Henry on the northern border - an activity actually being carried out by the next generation. Such slips can give rise to doubt about the overall accuracy, which would be a great pity as this is an absolutely excellent work, and should be on the shelf of any Tudor enthusiast. 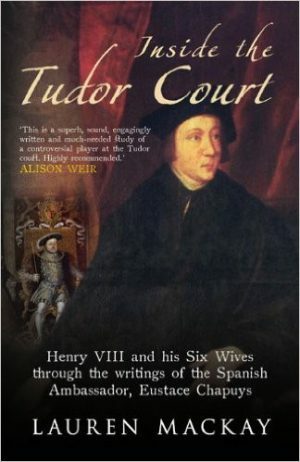 Note: Tudor Times received a review copy of the book from the publisher.